The bare facts, to start with. 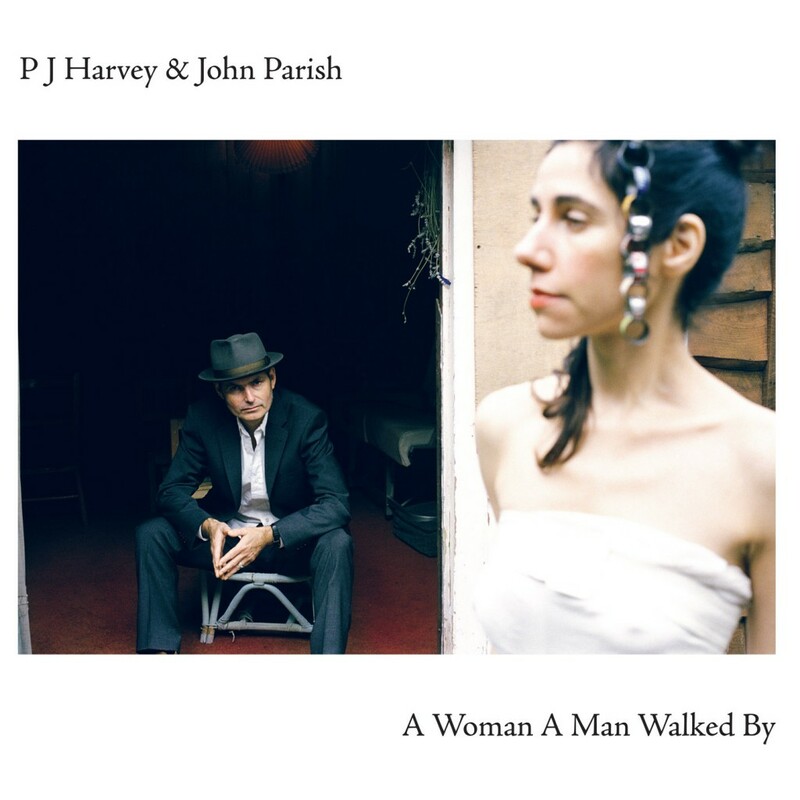 A Woman A Man Walked By is the second album co-written and jointly performed by Polly Jean Harvey and John Parish, and comes over 12 years after 1996’s Dance Hall At Louse Point. It was initially recorded at Parish and Harvey’s homes – and later, at a studio in Bristol where it was assisted by the contributions of three other musicians. Some of it is quiet, considered and reflective; at other moments, it verges on the deranged. By turns, it is mischievous, deadly serious, elegant and poetic, and possessed of a brutal power – and it is doubtful that you will hear a record as brimming with creative brio and musical invention this year. As with just about all the records that have featured its authors’ names either together or apart, it is based on one insight above all others: that repetition and comfy formulas are always to be avoided. So, though you can draw lines between this record and Dance Hall At Louse Point, there are occasions when you’d assume you were listening to the work of different people. The story that led them here stretches back to the late 1980s, and the first encounter between Parish – then in charge of a renowned West English group called Automatic Dlamini, co-founded by drummer Rob Ellis – and Harvey, who had somewhat optimistically booked them to perform at her 18th birthday party. Thanks to “internal band problems”, they didn’t actually play, but John soon received word of Polly’s talents from a friend, and suggested she join the group. Harvey cut her teeth in Automatic Dlamini, playing saxophone and contributing vocals, learning an abrasive, wonderfully rhythmic guitar style from John, and massively growing in self-confidence. She left the group in 1991, and John called time on the group not long after, commencing an admirably productive career as a songwriter, musician and producer that has seen not just three albums of his own – Rosie (2000), How Animals Move (2002) and Once Upon A Little Time (2005) – but collaborations with artists as varied as Giant Sand, Eels and Goldfrapp. Between 1994 and 1995, he co-produced and played on the PJ Harvey album To Bring You My Love, and joined her band on tour. In 1996, after Polly heard music John had written for a production of Hamlet and asked him whether the two of them could work on music that was as exciting and convention-breaking, the pair of them collaborated on the aforementioned Dance Hall At Louse Point. Towards the end of the 1990s, John was a featured musician on the Is This Desire? album and subsequent tour. And eventually – after eight or so years during which he and Polly recurrently sought each other’s opinions about their ongoing musical projects and ideas – he took up the same co-production role on 2007’s White Chalk, the album that many people see as Harvey’s most perfectly realised album thus far. At root, what fires this partnership is simple enough: that each brings talents and qualities to the creative process that working alone rules out. To take things down to the bare bones, Polly sings and writes the lyrics, and John composes the music, plays most of it, and takes charge of the arrangements – though behind that division of labour lurks a real empathy and shared intuition. Behind the combination of words and music, there lies a fascinating combination of accident and design. On this record, for example, the music for three songs – 16.15.14, The Chair and A Woman A Man Walked By – came with ready-made titles from John, which either sparked Polly’s imagination or pointed towards already-written lyrics that had accidentally suggested similar themes. On the musical side, A Woman A Man Walked By features additional musical contributions from Polly’s close associate Eric Drew Feldman, the California-based drummer Carla Azar (from the left-field band Autolux), and the Italian guitarist Giovanni Ferrario. Quite apart from the cracked time signatures and shifting arrangements that occasionally give its songs the air of creations pulled from its creators’ irrational, emotional, sometimes almost dreamlike thoughts, it’s also streaked with touches that push it even further beyond the orthodox: on The Soldier, a ringing ukulele mends with the merest frosting of piano to absolutely haunting effect; 16.15.14 features a banjo part that lends it the flavour of sepia-tinted Appalachian folk music; elsewhere, there are parts played on wonderfully arcane and obsolescent keyboards. And so to the immediate future. Polly Jean Harvey and John Parish will soon be performing songs from A Woman A Man Walked By and Dance Hall At Louse Point on the live stage. When it comes to their respective solo work, John has “half an album” written, and Polly has already begun work on her next project, which she anticipates being co-produced by John, Flood and Mick Harvey. As to when the two of them might co-write another record, Polly claims the long gap that separated Dance Hall At Louse Point and this album points up the right way to go. 2021 is approximately 4350 days away. But don’t worry: on the evidence of A Woman A Man Walked By, the wait will be worth it.